Compared with under the bonnet of your modern car, the engine bay of most classics is relatively simple. However while there have been many changes over the years, especially in electronics the basic principles remain. Through the burning of petrol or multiple tiny explosions an engine provides power and away we go. Everyone knows that the burning or explosions create heat and all engines are designed to operate within a certain temperature band. We also know that it’s important that engines reach that band quickly and not exceed it. 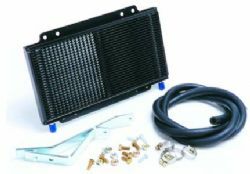 It’s the job of the radiator, water pump, thermostat and coolant to ensure the temperature is reached quickly and stays there. Think again about under the bonnet and especially the radiator fan. Your classic will probably have a fan driven by a V-section rubber belt, while your modern car has an electrically driven fan. A great innovation, but did you know that an Australian company pioneered the use of electric fans? It was Victorians Daryl Davies and Bill Craig who saw the inadequacies in the belt driven fan and together devised what we now know as the Thermatic Fan. 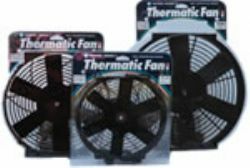 Of course there wouldn’t be a classic car enthusiast amongst us who hasn’t heard of the Thermatic Fan, but did you know that a Davies, Craig electric fan is now fitted as standard equipment in such diverse vehicles as the Chev Corvette, Camaro and the Chrysler Voyager? The advance into the burgeoning US market has been achieved through collaboration with the German company Siemens Electric Limited. Davies, Craig has moved on since the first Thermatic Fan and now produces a total of eight distinct electric fan kits in all sizes including twin fans and those specifically designed for automotive air conditioning. Why there is even an electric fan kit for the BMC Mini as well as replacement fans for most Nissan, Mazda and Toyota vehicles. Innovation brought us the first electric fan and that same creativity has lead Davies, Craig into other products cleverly designed to keep temperatures within correct levels. These include products like automatic transmission oil coolers and radiator fan viscous clutches. While the Thermatic Fan was a great leap forward in the early 1970s, some 25 years later Davies, Craig made a giant leap when they released their electric water pump. You are probably wondering why, if you already have a perfectly serviceable belt driven water pump what would be the purpose of an electrically driven unit. First of all think of how much power is used in pushing the water around the engine and through the hoses to the radiator. That’s important if you’re minded towards any form of motor sport and every hp counts. However think about the advantage if you could set the required coolant temperature and the water pump, through smart electronics maintains that temperature by controlling the coolant flow. I don’t know about you but I think that’s really clever. The Davies, Craig electric water pump comes in 2 differing capacities. The largest pumps up to 110 litres per minute while the smaller 80 litres per minute. When installing you have a choice of either removing the impeller from the original pump or removing the pump altogether and installing a blanking plate. 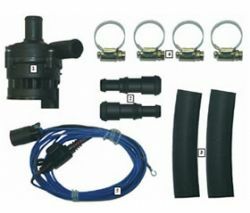 The Davies, Craig electric water pump can also be used as a booster for the original system. Using the electric pump means that there is no need for a thermostat. As they say in the classics “But wait, there’s more!” Davies, Craig is working at having the same smart electronics or controller connected not only to the electric water pump but to the electric fan as well. So if you set the controller at 85° C it allows the engine to reach its operating temperature quickly. Then with dual operation of the electric fan and water pump the temperature is maintained perfectly. The good news is that Davies, Craig is a wholly owned Aussie family company that employs 15 staff and their products are all made in Altona, Victoria right here in Australia. While some components come from the US and Japan everything else is made in Australia, even their plastic forming. Chief Executive Officer Richard Davies says that his company has a very bright future and are now in the development stage of an even lighter electric water pump. Richard says that within 10 years all new cars will be fitted with electric fans and water pumps. Think about the advantages of fitting a Davies, Craig electric fan or water pump to your classic car. If you would like to know more, Davies, Craig operates a hotline during business hours so you can discuss the solution to your cooling questions.